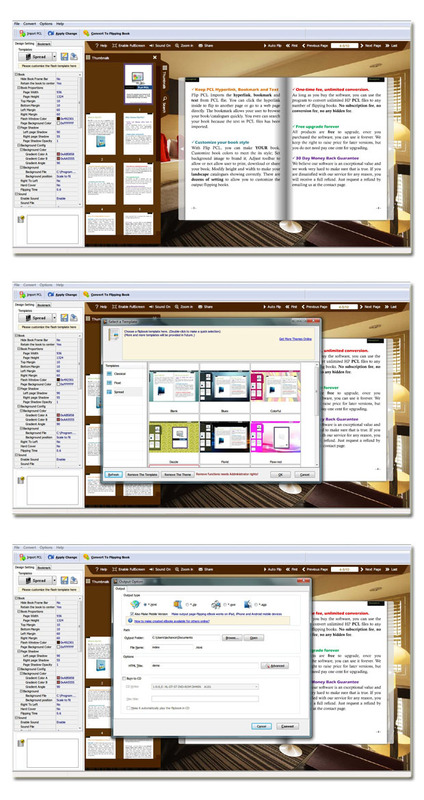 PCL to Flippingbook3D 2.0 Free Download - Convert PCL file to digital book with page turning effect applied! Last Updated: 9/20/2012 | File Size: 21840 KB | Price: $99 | Downloads: 97 | Developer: FlippingBook3D Ltd.
PCL to Flippingbook3D converter software is specially designed to turn your PCL file into page turning publication. In PCL to Flippingbook3D, you can customize your 3D book style easily, including add watermark, change background, enable download, print features, add passwords protection, etc. . It's stunning but easy-to-use software to create page turning book, without coding skills or any other application needed. Statement: First, please download the orginal installation package by clicking the download link. Of course you may also download it from the publisher's website. Using PCL to Flippingbook3D crack, key, patch, serial number, registration code, keygen is illegal. The download file hosted at publisher website. We do not provide any download link points to Rapidshare, Hotfile, Depositfiles, Mediafire, Filefactory, etc. or obtained from file sharing programs such as Limewire, Kazaa, Imesh, Ares, BearShare, BitTorrent, WinMX etc. Software piracy is theft. If you like PCL to Flippingbook3D please buy it.